Does your state have a patient/nurse ratio law? If not, how is it legal to do this? I don't think LPN's will be included in the nurse/patient ratio battle will they? Also, the more LPN's that are removed from acute care, ICU etc, the easier the organizing will be when the time comes...and it will come. I just urge all RN's to pay attention to what's going on. Unions can be a good thing or a very bad thing! If you can get the crushed/applesauce meds in the mouth sometimes putting a piece of crushed ice in will help the swallowing part! OP, Ask about funds for help to get your LPN license. When I asked for financial help for LPN schooling there was none, but there was $1,800 per semester for RN schooling (and signing a contract to work for a specified time). I wish you the best. We need to deal with the facts. "I think" and "I heard" don't always qualify as fact. I know that at my hospital I am the only full-time LPN on the acute care unit. That's down from 9 LPN's three years ago. I pay dues to a labor union (whether I am being represented is debatable). The RN's are not unionized but the term "RN" is actually mentioned in our contract! The elimination of LPN's here has been insidious--a little at a time. You LPN's who have years of experience-how have things changed where you work? Did any of you start out in ER or ICU but can no longer work there? Did you suddenly get "dumber"? I know where I work I see LPN's just accepting whatever is pushed on them with the usual complaining to co-workers or sometimes quitting. And there are those who recieved "mystery" money to attend an expensive non-traditional BSN program. I do not say that to reflect badly on an LPN or anyone who wants to further their education. It's just a little unclear where the reimbursement money came from. The union president says he don't know. Time will tell. I hope the posters are right about LPN's not being phased out...personally I believe the association and friends are working harder than ever, especially the past 2 years to phase out LPN's (and you'd be surprised by some that are in their corner). I keep hearing how LPN's have and can do so much that an RN can do, but look at the posters who say "I'm not allowed to assess, admit etc, anymore". The long term care unit in the hospital where I work stopped their LPN's from even measuring wounds. To me that is changing my job content, but to the LPN's on that unit it's "just one more thing I won't have to be responsible for". If LPN's are phased out it will be our own fault for allowing our "work" "at the bedside" to be taken away from us. My state has recently passed a bill and named the state RN board and state LPN board to plan a pilot program to allow unlicensed persons to administer meds in nursing homes. (One of the bill's sponsors was an RN turned delegate. )Many LPN's have been forced from the hospital setting already (I think certain areas are targeted at a time). What will this mean to resident safety and to LPN's in LTC (where they thought they would always have work)? If management can pay someone less to pass p.o. meds and if those managers are also association members wanting to eliminate LPN positions...then ADN nurses can give the injections, PRN's etc. Can you see the plan coming together??? Aides get a little more education to be able to pass po meds..ADN nurses pick up with injections and narcs, etc., and LPN's are gone--sooner or later. That leaves acute care etc. for BSN's and on up the 'professional registered nurse' ladder. Better wake up fellow LPN's! With this 'head in the sand' attitude we don't pose much of a threat to the ANA. I've been searching legislative action and writing to delegates in my state regarding bills concerning my job. We can post all we want but it is probably safe to say that not many delegates or congressman read here (but I'll wager that there are ANA members who do!) I hope to see a lot of response to this post...that at least a few are checking your state lawmaking website, if only to get your representatives' e-mail address and drop him/her a question about bills/votes concerning your/our jobs. I am surprised the CNA is allowed to replace tele or was she assigned a task outside her scope? But if she can place a foley then surely she can put tele electrodes/snaps on! How Can Hospitals Afford Not To Hire? What part of the US do you work in? 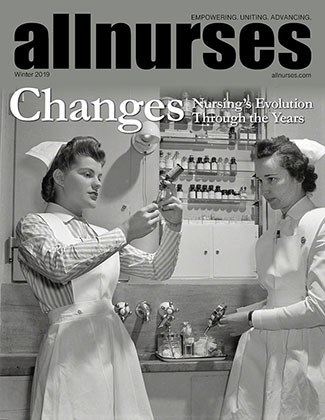 Do you mean that RN's are doing more paper- and aide work? I believe there is a push to get rid of LPN's and unit clerks and aides are also fired to avoid an appearance of discrimination. What do you mean "the RN/LPN union wines and dines with the managers"? What is your personal view about LPN's and do they even fit into nursing any more, with the move to unionize RN's? Are there LPN's working at these newly unionized facilities in Acute Care/Med-Surg etc? and how has their job duties changed over the last few years?